Map maker : Braun & Hogenberg. Date : Cologne, ca. 1588. Size : 11.4 x 16.9 inches. / 29.0 x 43.0 cm. Description :A beautifully rendered and decorative bird's-eye view of the famous English town of Canterbury. 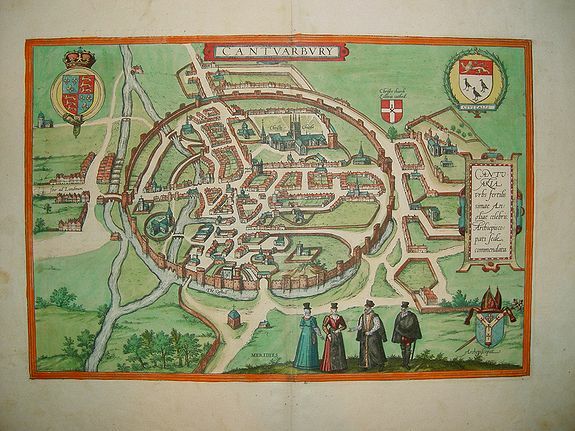 The plan identifies important sites and contains four coats-of-arms along with foreground figures in regional dress. Verso text is in Latin. From Braun & Hogenberg's epic work, CIVITATES ORBIS TERRARUM. Condition : In very good to near-excellent condition. Thick, strong paper. Fine period correct colouring. There are a few faint handling smudges in the ample margins, well away from the plate and easily remove with appropriate materials.